I start work early, can’t really use my phone while I’m at work, but then finish early. So a nice daily personalised newspaper delivered early afternoon would be perfect. The three read-later services I’ve tried are Pocket, Readability, and Instapaper. 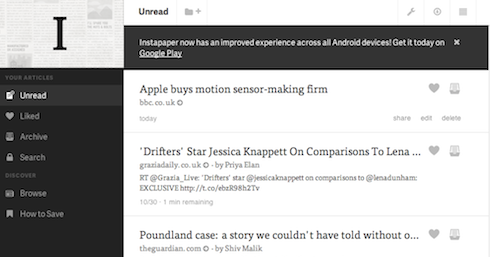 Readability and Instapaper both have the option to email a daily digest of articles to your Kindle. Pocket doesn’t have this functionality natively, but can do it through a third-party service called Crofflr, which has a one-time setup fee of $5. All three systems have some ability to import from each other (if you want to try them all out, as I did), but that isn’t as simple as you’d hope. They are all as easy as each other for saving articles to read later. So what are they like for everything else? It saves reasonably well, and automatically delivers to Kindle, but sadly – at whatever the hell time it feels like. My goal was to save things to Instapaper during the day and read it when I’m home from work, so have it ready to read between 3 and 5pm. To start with, it would seem quite regular, albeit at the wrong time. I would set it to deliver at 14:00, and it would deliver it about 18:00, pretty consistently. And then it got more erratic. Over maybe 20 days, I’d estimate that on 4-5 occasions, it delivered it the day after. In the worst case, nearly 18 hours after it was meant to have sent it. 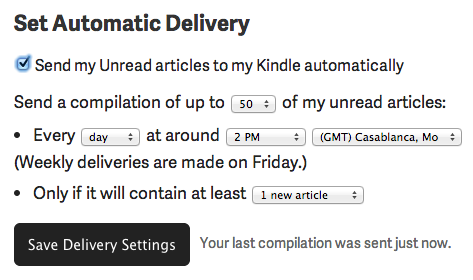 When you go into the “set automatic delivery” screen, it has a bit that tells you when the last digest was sent, but it *always* says “your last compilation was sent just now”, when it clearly wasn’t. No, it wasn’t sent just now. The periodical digest on the Kindle (when it does eventually arrive) is a good format, and easy to read, but does have occasional formatting errors (like repeating sections – nothing that stops you reading the text, as such). It also removes photos for some reason. The other two services don’t, so I don’t know why this is. The service is the only of the three that datestamps the articles you save, so you can see before you read things that you saved that article “yesterday”, which I find very useful. Sadly, this datestamp information only appears on the web version – not via the mobile apps or on the Kindle digest. “Instapaper: Thursday, Oct. 17 17 October 13”. 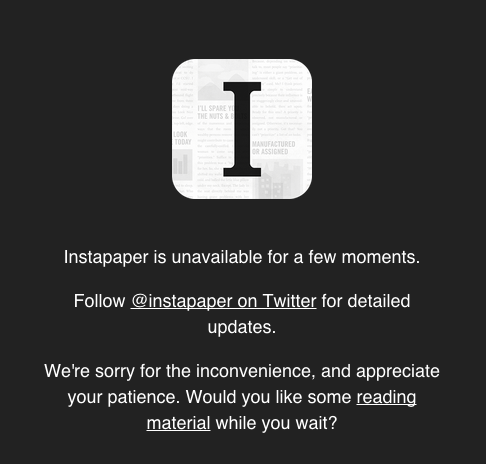 On the web version, Instapaper tells you how long it will take to read an article before you open it. But it doesn’t carry this feature over onto the iOS or Kindle version, which is a shame. You can archive stuff from the mobile app, or from the Kindle version it sends, which is nice. If you read on a mobile and then archive, it remains accessible on the device. There used to be an option to archive all older than say 30 days, but this option appears to have disappeared with a recent redesign (or isn’t in a very obvious place). Now you can either archive all the unread list, or delete all the archive – but can’t just select 10 articles to archive, at once – you have to do them one at a time. You can do it via the app though. (This is a running theme/quirk with all three services). 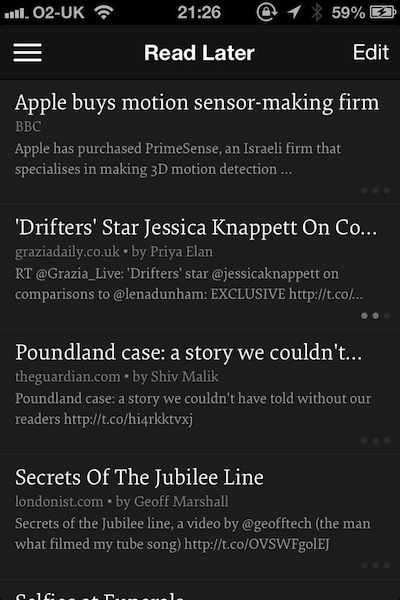 Instapaper article list on iPhone, using dark theme. One of the things that got me looking around at rivals to start with was some quite lengthy periods of downtime a few months back. It was doing quite well, but then there was more downtime while I was writing this, which isn’t great. Pocket has a good, clean, uncluttered browser interface. It also has a good iPhone app. Of the three, I think it has the best looking interface on iOS. It’s also nice that it gives you a picture to associate with some stories, when you view the list. An article about an MP, might well have a picture of that MP next to it, for example. Sadly, it doesn’t deliver to Kindle natively, but can with the aid of Crofflr. It’ll cost you $5 one-off signup to try out Crofflr. Testing for a few days, I found Crofflr to work reliably, but whether this would be the case over a longer period, I don’t know. The Pocket iPhone app does full-width pictures in articles, which appears more pleasing to look at, even if it’s the same picture as the other two are showing. Of the three services, Pocket’s web site most closely resembles the iOS app, which is helpful for users. It’s a shame that it doesn’t appear to date stamp the articles when you saved them. It doesn’t stamp them when you archived them either – you just have articles in one place, and articles in the other, apparently sorted either oldest or newest first. Pocket seems to have the most support both in terms of ways you can save articles to it, but also in where Pocket can share links onto. It also has desktop apps available. Of the three, I found Pocket to be the best at rendering articles, and producing the least formatting errors, that I noticed. The browser view seems to have a lot going on at once, if you ask me. The reading list should surely be the main focus of attention, but I’m distracted by tags and other rarely used options. The iOS app is ok. It’s probably my least favourite of the three, but there’s nothing really wrong with it per-say. 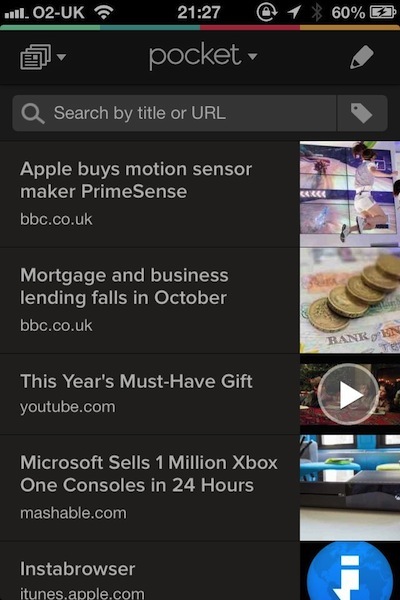 Readability article list on iPhone – using dark theme. It just seems to lack a bit of the finesse of the other two. I also found it a bit counterintuitive. Sometimes you need to swipe to go back, but from the reading list to the archives is a tap at the top of the screen first for some reason. Every time it archives something it disappears off the device. So if you want to read it again, you have to go top of the screen, and select archives. At which point you’ll be presented with an option to download ALL your previous archives, or not access it at all. By default, it keeps no archives on the device, and so I can quite envisage that at some point you go to find something you’ve archived “I must show you that thing I read yesterday, Dave”, and you’ve got 1,000+ old archives to download (on 3g, of course) before you can find it. 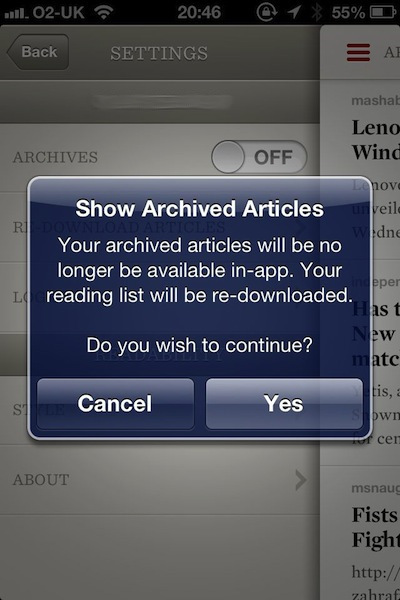 If, after you’ve read one, you turn archives off, so that it doesn’t keep *everything*, it then tells you it’s going to remove all of the archives from the device, and will have to download all of your reading list again in the process for some reason. It could be better, frankly. Page swipes and little animations are nice, but I think the other two are more usable. Readability has a “purge” option, where you can automatically archive articles that are 5 days, 2 weeks, 1 month or 3 months old. This is a good feature if, like me, you save more than you ever have time to read. Readability does deliver periodicals to Kindle, at the right time. In a test over several weeks, I had the “Amazon has delivered to the Kindle” type email, within 15mins of the time it is meant to be delivered, every single time. 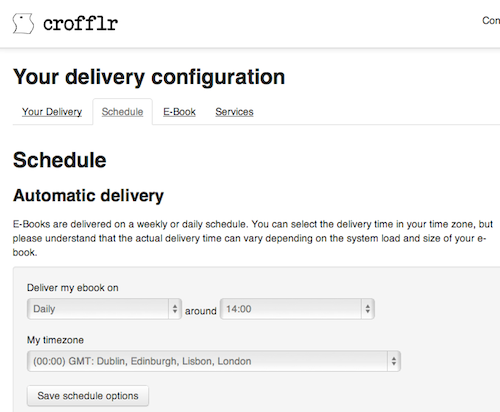 Given there is a delay while Amazon convert/send, I’d say this is pretty spot on perfect, at Readability’s end. “Readability – 10/14/13 14 October 13”. To be honest, they’d be better off just labelling it as “Readability – Monday” because Amazon stamps a date on it anyway. Readability do have the option to turn the date off, but not to add a day. Readability seems to suffer the most glitches of the three. On several occasions I’ve noticed it will miss out something, usually from the very beginning of the story (sometimes a picture which shows a crucial person/place involved in the story, or an important sub-headline), whereas Instapaper/Pocket do not on the same page. On one occasion when attempting to save something from Digitalspy, what turned up on Readability was just a page of the ‘related links’ (on the right of Digitalspy’s site) with the actual news story missing. 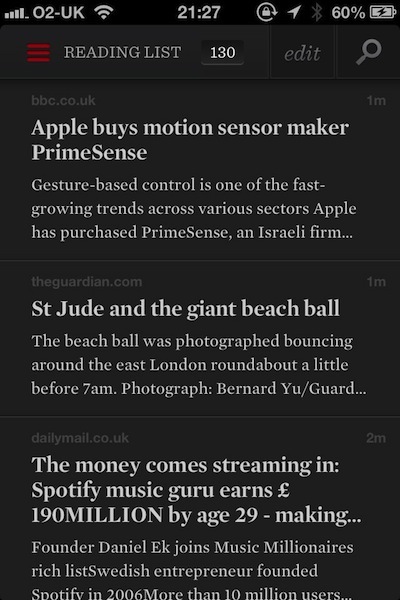 The same story showed as expected on Instapaper and Pocket. They all allow you to search for articles stored in either unread or archives, but on the web version, both Readability and Pocket search as you type, whereas on Instapaper you have to press return before it starts searching. A minor inconvenience, but since Google launched it, we’re all used to seeing results as we type, I think. Instapaper, Pocket and Readability can all be accessed by the ebook conversion/management software Calibre, so if you want, and you don’t mind plugging a cable in to do it, you can download your articles with Calibre, and sync to any e-reader you might have like a Sony, Nook or Kobo. It’s not just for Kindles. From a quick google search it seems that it’s easier to do this with Pocket and Instapaper, than it is with Readability, but I haven’t actually tried it, so don’t quote me on that. Both Readability and Instapaper allow you to archive the news stories from within a Kindle digest (after you’ve read a story, you archive it, so you don’t get the same one again the day after) but only Readability allows you to automatically archive everything sent to Kindle. I found this a mixed blessing. Still not sure if that’s a good idea or not. A select-some, or select all, or select-shift-select type option would be welcomed on the web version of ALL of them for deleting/archiving articles. Strangely they all allow you to do this from the mobile app, fine, but not from the web clients. Odd. After a couple of weeks of using Readability, say I’d like to export the articles saved, to Instapaper. Instapaper can import the Readability export file. Should be easy, right? Sadly, Readability will only export documents from your reading (unread) list, not the archive. At the time of attempting this, I had it set to send articles to my Kindle, so it had auto-archived EVERYTHING and the unread list was now empty. I later discovered you can select multiple articles on the iOS app to unarchive, BUT there’s still no ‘select all’ option. I couldn’t find an option to import lists to Readability. There’s probably a hack somewhere to do it, though. Pocket offers an option to “export HTML file”. It exports everything – there’s no options at all. Instapaper can read this file. Going Pocket -> Instapaper is really easy. Readability -> Pocket is a bit more fiddly. Readability exports to a .json file, which Pocket can’t actually open. So you need to follow the instructions in this article: http://lifehacker.com/how-to-import-instapaper-or-readability-articles-into-p-508858815 – which works, and tells you how to convert the .json to a .html file that pocket can then understand. Instapaper exports to a .html file that Pocket can import. Pocket exports to .html that Instapaper can import. Readability exports to a .json file that Instapaper can open. Instapaper is good at importing and exporting. The same article in (left-to-right) Pocket, Instapaper, Readability on iPhone. The iOS app is the best, and while it can’t send a digest to Kindle natively, it works fine through Crofflr. It seems the best at understanding web pages, and doesn’t miss pictures or mess up the formatting as much as the other two. It probably wastes the least amount of screen space by recognising when subheadings and picture captions should be smaller than other text, which the other two are not brilliant at. The website is also less cluttered. It imports and exports well, works reasonably well, and mostly results in a readable article, viewable online or on Kindle. The datestamps are useful, but they’re only viewable on the web version for some reason. The app works fine, but while it does deliver to Kindle, it does it at incredibly unreliable times. The website seems to waiver from being seemingly quick, to incredibly slow, sometimes in the space of only a few minutes. It isn’t terrible, BUT the inability to access some archives on iOS without downloading ALL of them is annoying. Couldn’t it keep the last 20 or so, and then have a “show more” type option? During my tests, it also made the most errors in terms of website formatting, resulting in missing photos or – on one occasion – the entire story missing and just the “related links” and adverts showing. I’m not sure about automatically archiving everything sent to Kindle, but the option to purge anything older than than x many days should mean I keep on top of it a bit better. Which IS a standout feature neither of the other two have, but I don’t think it’s enough to counteract its current shortcomings in other areas.